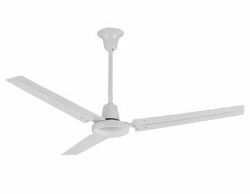 The CECx destratification fan is designed with a punched louvre design. Boasting minimal running costs and very little maintenance, this unit simply recirculates warm air from the floor/suspended heaters into the space below. 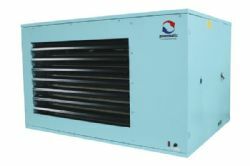 An ideal solution for heating; factories, agricultural buildings and sports & leisure facilities. 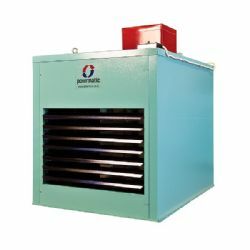 These Warm Air Gas & Oil cabinet hears are fitted with a mounted fan, motor assemblies, a stainless steel combustion chamber and a mild steel heat exchanger. 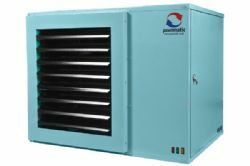 This particular range covers 13 models ranging from 30kW to 590kW, available in either upright or horizontal configurations these models can be installed directly into the space that requires heating. HCF Sweep Fans are specifically designed to lower the overall costs associated with space heating systems, they contribute to comfort levels by manipulating a consistent pattern of heat throughout the working area. With all space heating systems there is wasted heat, installing a HCF fan takes that wasted heat and redistributes it into the working zone. NVS suspended air heaters are an ideal warm air solution for; factories, warehouses, working garages and aircraft hangars. 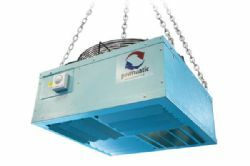 These suspended condensed air gas units are designed to provide efficient and cost effective heating and ventilation to a wide range of industries. The NVS is unique in terms of offering both heating and ventilation, separate of each other within the same unit. NVx warm air heaters are designed to provide efficient and cost effective heating to both industrial and commercial properties. 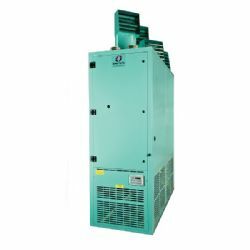 The range is comprised of 11 models ranging from 15kW to 140kW output levels. In addition to the standard models, we also have access to the new reduced width NVx twin fanned units - these smaller units are super easy to install and can fit in very tight areas. 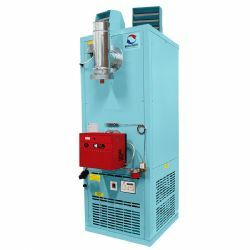 These Suspended Oil Unit Heaters are indirect oil fired warm air heaters designed with heat exchangers and a downward firing pressure jet oil burner. A popular combination for the OUH is an axial free blowing fan, this allows wasted heat to be redistributed back into the working area - reducing costs and increasing overall efficiency. VPC air heaters are floor standing with outputs ranging from 15.7kW up to 135kW, each model comes with a closed flue system that can be operated either vertically or horizontally. High/Low formats give a turn down facility of approximately 2:1, also delivered with the unit is a MC200 controller as standard.